The sequel to ‘Finding Nemo’ is pretty much what one would expect from a Pixar sequel, building on the world developed in the first film but keeping things relatively safe from a storytelling perspective. That’s not a bad thing when the world you’re delving back into is the rich ocean landscape introduced in ‘Finding Nemo’, and the ‘Toy Story’ series aside this is one of Pixar’s strongest sequels. Sometimes expanding on a popular supporting character in their own film can be a mistake, but ‘Finding Dory’ gets the balance right to expand on Dory’s character without it ever feeling like too much. 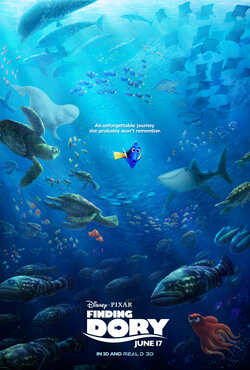 There’s little in the way of originality here, both in comparison with ‘Finding Nemo’ and a large proportion of Pixar’s output, as the story revolves around Dory going missing this time, with the roles reversed this time as Nemo finds himself in the search party, alongside his father Marlin (Albert Brooks). Much of what is good about ‘Finding Dory’ is not unexpected from Pixar, but it still warrants praise. Whilst lighter on story, ‘Finding Dory’ uses our connection with these characters and Dory in particular to really invest us in her story and the narrative reaches for and achieves substantial emotional depth. The animation is as beautiful as ever, crafting a superbly detailed and visually sumptuous impression of the ocean landscape, and like the best Pixar worlds, you could happily lose yourself in it. Ellen DeGeneres brings the same sweet innocence to Dory as she did in the first film and it’s easy to get caught up in her mission to find her parents, even if the end result goes for the straightforward option ahead of a more complex conclusion. Hey, it is a kids film after all! There’s a host of great voices in the supporting cast, with a lot of the fun coming from picking out where you recognise them from. Ed O’Neill’s grouchy old octopus Hank is a great partner for Dory, but I’ll reserve a special mention for reunited ‘The Wire’ duo Idris Elba and Dominic West as a pair of territorial sea lions who get most of the best lines and laughs. ‘Finding Dory’ is not vintage Pixar, but just good Pixar is still better than most and what ‘Finding Dory’ may lack in originality, it more than makes up for with charm, good humour and an emotionally satisfying narrative that justifies the sequel’s existence.